[map] [street view] Between Memorial Parkway SW and Robinwood Drive SW, just south and off of Hollywood Boulevard NW. Co-located with WPSM, WNCV and WTKE. PS-If you change stations, I'll put your "check engine" light on! PS-The Most Fun On The Emerald Coast! Text-Highway 98 Country We Are Just More Fun! AUX: 12 kW @ 342 feet. 60 dBu protected contour map, from the FCC. Primarily an Okaloosa County station, it reaches the eastern half of Pensacola and Gulf Breeze with a decent signal. Strong in Niceville and Crestview, and listenable in De Funiak Springs. 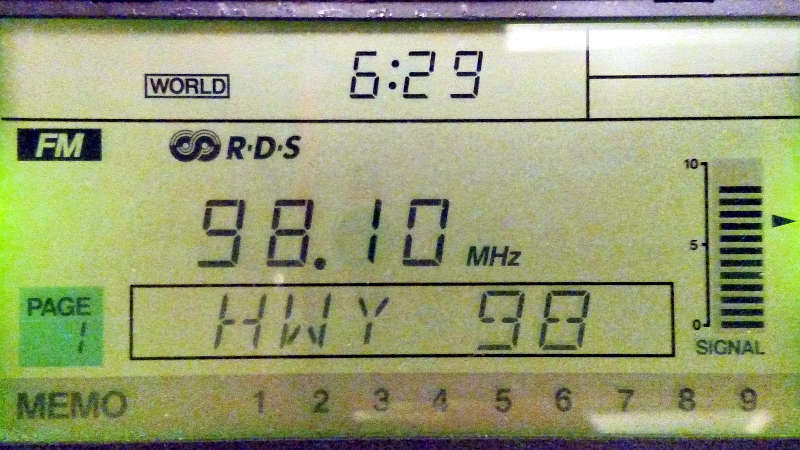 [Picture] Image showing the RDS text display of an Insignia HD portable showing the PI (call letters) and Radio Text. [Picture] Image showing the RDS text display of a Radio Shack DX-398 portable, showing the PS (station name) field. [Studio] Street View imagery of the Apex cluster's Fort Walton Beach studios, at Perry and Ferry and Chestnut. This station came on the air in 1951 as WCTA-FM (CovingTon Andalusia), companion of WCTA-AM. In the 60's it became WNBX with a MOR/easy listening type format. In the late 60's or early 70's, it became WCTA-FM again, simulcasting the AM station. In 1976 WCTA-AM was sold, and the FM spun off to a completely automated adult contemporary format with WQHQ as the new call sign. In the mid 80's the station was simulcasting their AM counterpart with a CHR format, and later as a country station. The calls changed to WWSF on January 1st, 1989 as "The Surf" with an oldies format. The station was trying to make it in the growing Fort Walton Beach and Pensacola areas. Eventually they achieved several years of dominant Arbitrons until more localized competition slowed the momentum. As "The Surf", they had a neat slogan: "98 Surf FM reaches the beaches, rocks the docks and shakes the lakes!" In October 1994 the station became WXCR, classic rock; exactly one year later it was back to WWSF "The Surf" (this time with 70's and 80's oldies). Eventually went all-sports and news, with callsign WTKE (the moniker was "the TicKEt") taking effect March 1999. It is likely the first 100,000 watt FM sports talk station. In fact, it may have been the ONLY 100 kW FM sports station for years before the format began migrating to FM in major markets. In the late 80's the station wanted to move south to get into the growing Ft. Walton Beach/Destin/Pensacola market, but at the time FCC rules didn't allow a station to change it's city of license. So, they moved the transmitter site as far south as they could while still providing a city-grade signal to Andalusia. This allowed them to put a signal into Ft. Walton Beach and Pensacola, but it still wasn't quite strong enough to be a major competitor. This was a Class C1 station covering a whole lot of nothing! In later years the FCC relaxed their rules regarding changes and moves, and the station was able to re-license itself to Holt, FL. The FCC's new rules give preference to applications giving a city or town its first station, and it doesn't matter where that station is trying to serve. So while the tiny community of Holt, just off I-10 in Okaloosa County didn't have a station licensed to it, it is obviously well within the coverage area of several AM and FM stations in south Alabama and the Pensacola/Ft. Walton Beach market area. This allowed the owners to actually put the transmitter site right in downtown Ft. Walton Beach, eliminating any coverage issues there, in growing Destin or in Pensacola. Ownership of this station was contentious in the 2000's. Going back to the mid-90's this station was part of the Clear Channel empire. They sold it to Star Broadcasting (Ron Hale) in 2003. Star Broadcasting turned around and sold the station just a few months later to Qantum of Fort Walton Beach. But then Star tried to also sell it to Cumulus for cash plus ownership of FM 105.5 in Fort Walton Beach. This led to lawsuits, which in turn led to Cumulus dropping out and leaving ownership to Qantum. In 2009 a station show host by the name of Scott McKinney caused controversy when he plead guilty to multiple charges of fraud stemming from a scheme to get investors to fund his Southern Sports Tonight radio program. He was convicted in February 2009 and will serve time for his deeds. The call sign was WRKN briefly in 2009; this call sign has been on at least three Fort Walton Beach area stations at one point or another. 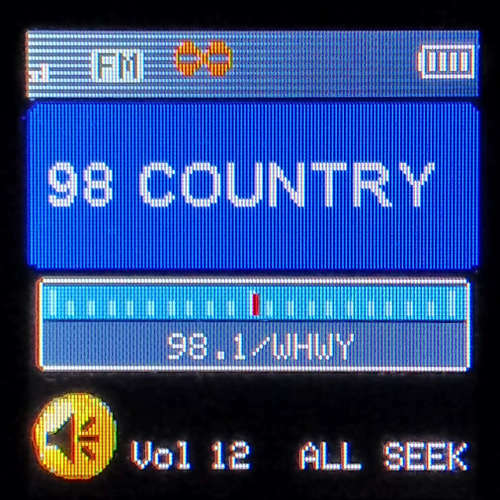 In January 2010 the station flipped from sports talk to country, as Highway 98 with the WHWY call sign. The sports moved to co-owned FM 100.3 and took the WTKE-FM calls along. In December 2011 all the Qantum stations in the FWB market were sold to Apex. In late June 2016 it was announced that the South Carolina-based Community Broadcasters, LLC, acquired the entire Apex Fort Walton radio ground for an undisclosed sum.